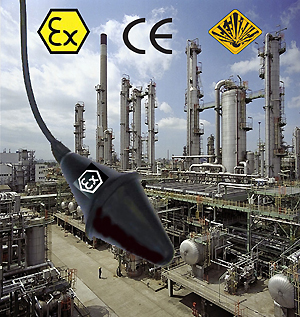 Among a wide range of float level switches, ATMI propose SOBA EX ATEX certified level regulator, a heavy duty float level switch specially designed for hazardous areas 0,1,2 (gas) and 20,21,22 (dust). Among a wide range of float level switches, ATMI proposes SOBA EX ATEX certified level regulator, a heavy duty float level switch specially designed for hazardous areas 0,1,2 (gas) and 20,21,22 (dust). This float level switch for hazardous areas is compatible with the most corrosive liquids frequently found in the chemical, oil and gas, mining, pharmaceutical and shipping industries. Thanks to its double housing, a polypropylene copolymere housing with a vulcanised HR HY coating this float switch benefits from a double waterproof. Power supply: 12,24 VAC/VDC, IP6X, Cut-out power: 10A with an intrinsic safety relay, max. pressure 4 bars, 3x1mm2 HR HY cable.